Deaf Centre Manitoba Inc.: Another friendly reminder- Notice of Manitoba Deaf Association (MDA) Annual General Meeting - TOMORROW AT Deaf Centre Manitoba!!!! 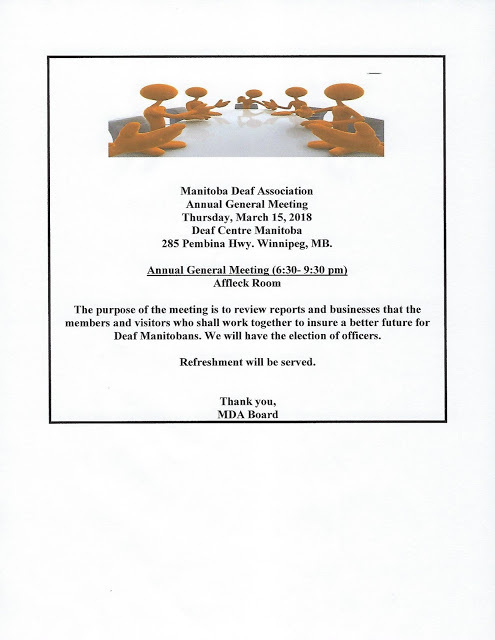 Another friendly reminder- Notice of Manitoba Deaf Association (MDA) Annual General Meeting - TOMORROW AT Deaf Centre Manitoba!!!! ATTENTION: Location is at DEAF CENTRE MANITOBA on 285 Pembina Highway!